As any long distance adventurer knows, your tools change and adapt as you gain experience and perspective. So, we thought we would write a post about our kitchen tools early in the trip and document the differences as we change our perspective. This is our entire kitchen minus our “cups” . 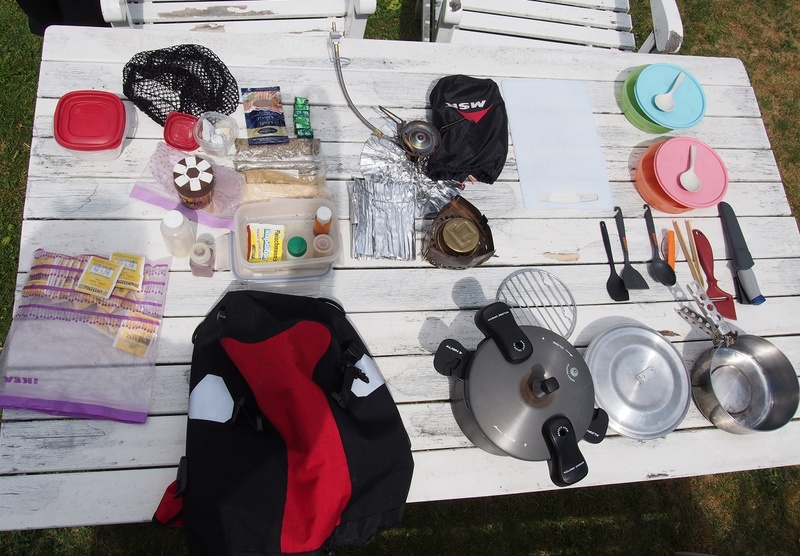 Except for the pans, all of this is carried in Janet’s front pannier. We affectionately call that pannier “the kitchen”. As in, get the kitchen off your bike… or hand me the kitchen. 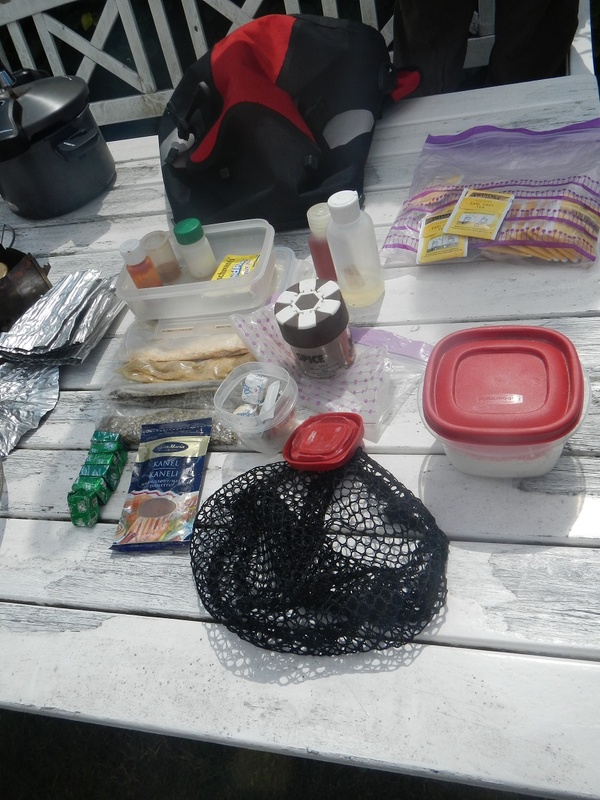 The idea for our kitchen pannier came from Tara of Going Slowly in her Bike, Camp, Cook book. Spices are very important to us- they can make a bland food yummy. Thanks to Alexa Longman, our spice kit actually has some organization to it (see, a little perspective is already gained). We have the following spices with us: Salt, pepper, cayenne pepper, paprika, mixed Italian, oregano, garlic salt, wine vinegar curry (lots of curry), cinnamon, chicken stock cubes, vegetable oil, sugar and yeast. We also carry staples with us: flour, onion, garlic, butter and earl grey tea. We typically have some kind of starch with us: rice, pasta, bread, potato, couscous or other local affair. Stoves: We have two stoves with us- yes, two. It has been very handy to have two stoves, especially if you want a hot drink with dinner! When Alexa was with us we had three stoves! 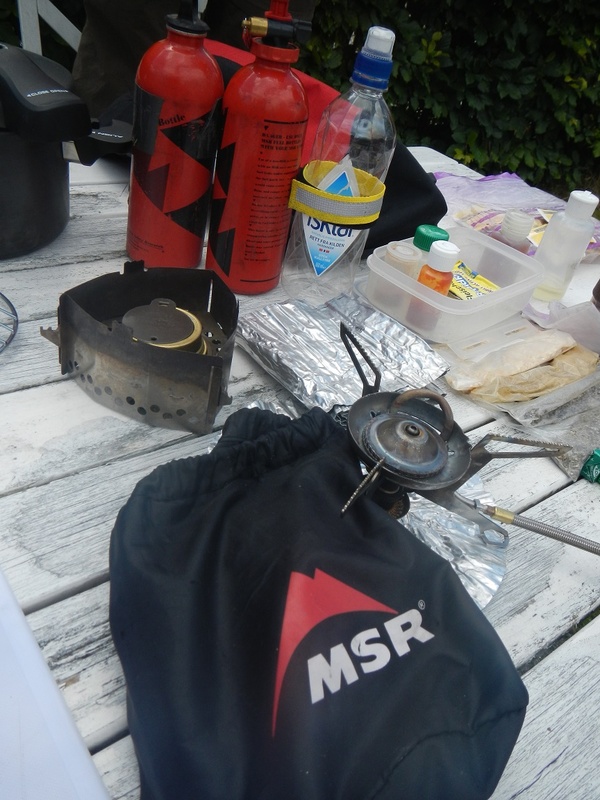 We love our MSR Whisperlite Universal stove. 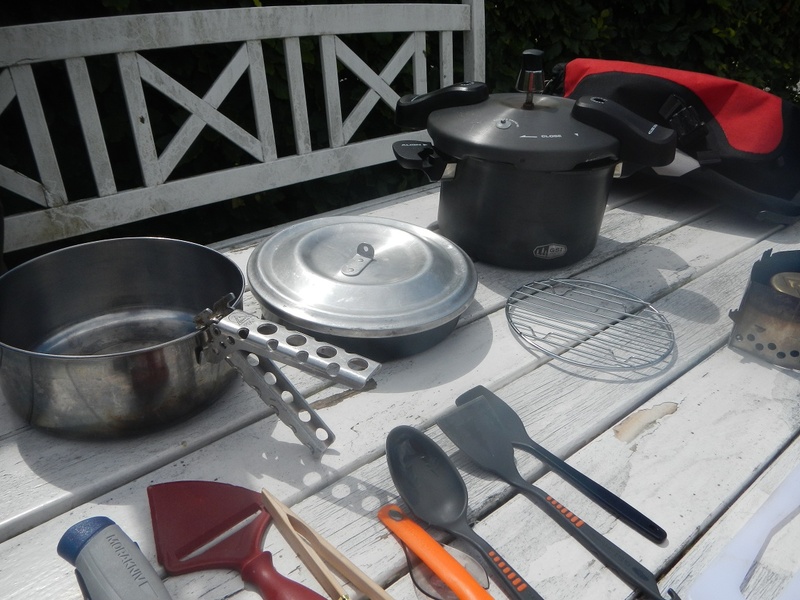 This backpacking stove is light weight, compact and allows us to use just about any fuel available. The Trangia burner with the Clickstand S-2 base. This stove burns simple spirits (ethanol and methanol). Alexa had the full Trangia 27 Set complete with a kettle. 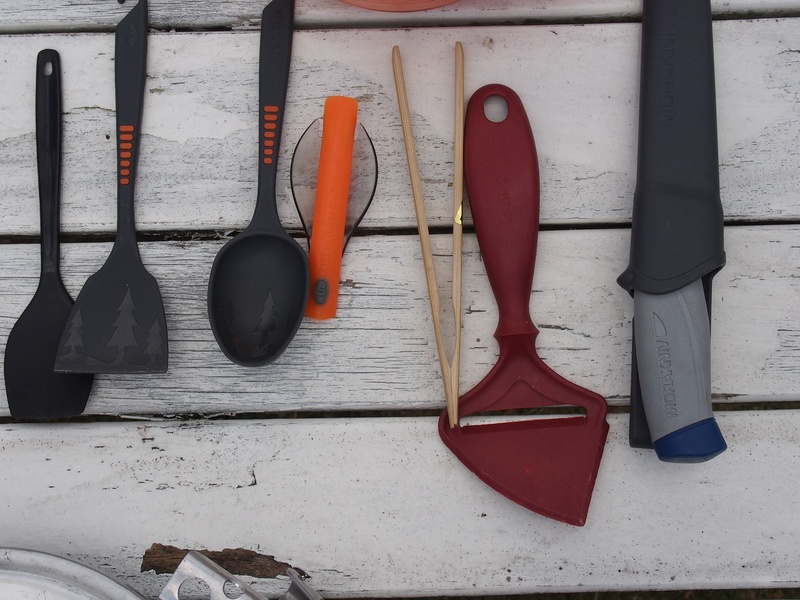 We are currently using the GSI spoon and spatula, a spork, a bamboo set of tongs, Mora knife, an old P-38 can opener (not pictured) and a must have cheese slicer thanks to Oivind Nielsen from Lillisand. Those Norwegians love their cheese. Yes, you are not mistaken, that is a pressure cooker you see! We are carrying the Halulite 2.7 L pressure cooker from GSI. We thought we would bring the pressure cooker on the first leg or our journey and see if it is worth the weight. So far, we have used it for more than half of our meals. Janet made an awesome Dahl Bhat the other night that would have taken a lot of fuel and time without the pressure cooker. Another favorite pan we use a lot is the Banks Alpine Fry Bake pan which we discovered on our NOLS mountaineering course in 2004. The fry bake is perfect for baking as the name suggests. We have made all kinds of goodies already including pizza, scones and cinnamon rolls from scratch (hence the yeast and flour). Our last pot is a simple 1.5 L stainless steal pot from MSR Alpine 2 pot set – and the pot grip. The small pot nests nicely into the pressure cooker for easy storage. We use the lid from the fry bake on our small stainless steel pot. These Tupperware microwaveable cereal bowls have been our mainstay for eating in all of our back country adventures for 10 years. Yes, when we first invested in the four bowl set we thought they were a bit pricey- but they have earned their keep. 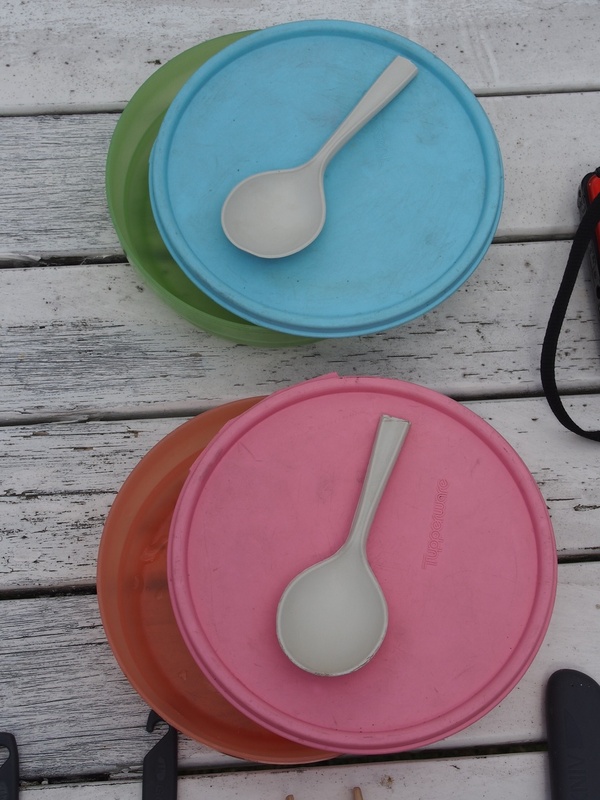 The lids fit snuggly and stay on reliably in your pack which is great for left overs. The lids also make excellent cutting boards and serving plates. We did trim the tab off the lid to reduce the chance of them becoming accidentally dislodged. Clean-up is dead easy- pop a little water and soap in the bowl, put the lid on and shake, shake, shake. Rinse. Beautifully simple. And colorful, too. Last but not least are our Liberty Mountain lexan spoons. The handles have been cut down to easily fit inside our bowls. That is the kitchen we use. We can and do cook anything. With a little imagination and basic cooking knowledge we can create simple and complex meals anywhere in the world. Often our meals are dictated by the availability of fresh goods and our hunger level. There is no reason to eat poorly just because you are in the back country!